The FBI has been investigating Russia’s interference into the 2016 presidential election since 2016. Trump is a figure of interest in multiple threads of the Russia investigation. He was also an unindicted coconspirator in a separate criminal case brought against Michael Cohen by the Manhattan US attorney’s office. Justice Department veterans say that even if prosecutors have enough evidence to indict Trump, they would refrain from doing so because department guidelines say a sitting president cannot be charged with a crime. Whitaker was criticized on Monday by some who said it looked like he was publicly pressuring the special counsel Robert Mueller to wrap up the investigation. Matthew Whitaker, the acting attorney general, said Monday that the special counsel Robert Mueller’s investigation into Russian interference in the 2016 election is nearing its conclusion. Whitaker made the statement during a news conference at which the Justice Department announced it was formally charging the Chinese telecom company Huawei and its CFO with helping banks sidestep sanctions on Iran and for stealing trade secrets. The FBI has been investigating Russia’s interference in the election since the summer of 2016. As part of the investigation, Mueller is also looking into whether members of President Donald Trump’s campaign secretly worked with Moscow to tilt the election in his favor, and whether Trump sought to obstruct justice when he fired FBI director James Comey in 2017. Last week, prosecutors charged the longtime GOP strategist Roger Stone with obstruction, false statements, and witness tampering. 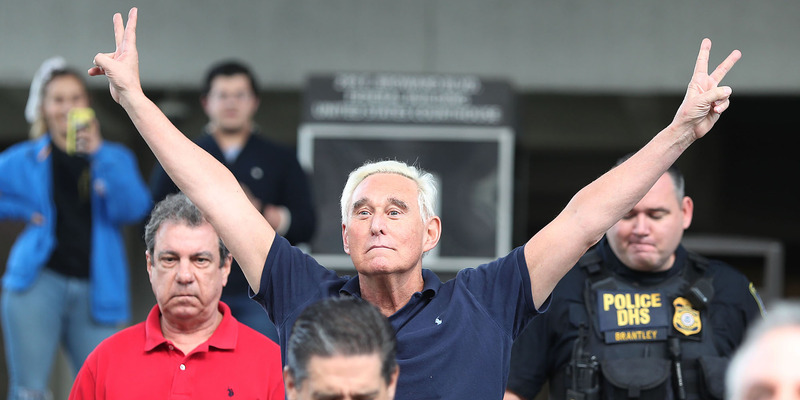 Legal scholars say more indictments against Stone’s associates will likely be handed down in the coming weeks as well. Several other Trump associates have also been charged, including former national security adviser Michael Flynn, former campaign chairman Paul Manafort, former deputy campaign chairman Rick Gates, and former campaign aide George Papadopoulos. Dozens of Russian nationals and several Russian entities have also been charged as part of the probe. Trump is a figure of interest in many threads of the investigation, including Comey’s firing and other reported efforts to hamper the investigation; the Trump Organization’s efforts to build a Trump Tower in Moscow; Russia’s hack of the Democratic National Committee; WikiLeaks‘ subsequent dissemination of stolen emails; a meeting between top campaign officials and Russians at Trump Tower in June 2016; and more. He was also named as an unindicted co-conspirator in a separate criminal case against his former lawyer, Michael Cohen, brought by the US attorney’s office in Manhattan. Justice Department veterans say that even if prosecutors have evidence showing that Trump engaged in criminal conduct, it’s unlikely he would be indicted because current Justice Department guidelines say a sitting president cannot be charged. Instead, Mueller is said to be putting together a report of his findings for deputy attorney general Rod Rosenstein, who is overseeing the investigation. Rosenstein is expected to release the report to Congress, which would then make it available for the public. Some legal experts criticized Whitaker’s decision to publicly comment on the Mueller probe Monday, particularly given the controversies surrounding his appointment as acting attorney general after Trump ousted Jeff Sessions last year. Chief among them were several comments Whitaker made criticizing the investigation and musing about how to render it ineffective. „I hope that when this is over, Mueller will publicly make clear the extent of any interference with his investigation from anyone,“ Mariotti wrote. It’s unclear how it would affect pending court cases and indictments if Mueller were to wrap up the investigation and submit a final report. Former Trump campaign chairman Paul Manafort is currently locked in legal battle with prosecutors who accused him of breaching his plea deal after agreeing to cooperate with them. Some media reports have said Mueller is weighing whether to put Manafort on trial again. Meanwhile, it surfaced last year that the Justice Department is gearing up to indict WikiLeaks founder Julian Assange. Stone also said he doesn’t intend to plead guilty and will go to trial after being charged with seven counts last week. And Justice Department veterans have said Jerome Corsi, the far-right political commentator referenced — but not named — in Stone’s indictment may also be charged soon. Live TV musicals like 'Rent' are missing the mark. Here are 2 things they're consistently getting wrong.